I have this sneaking suspicious that if everyone who is creating "memes" about Mittens & Big Bird actually became a member of their local PBS affiliate then PBS wouldn't need the government's money anyway. If that happened, Social Conservatives* could then spend more time trying to save Americans from that pox on society known as "the Arts". Or fluoridated water. 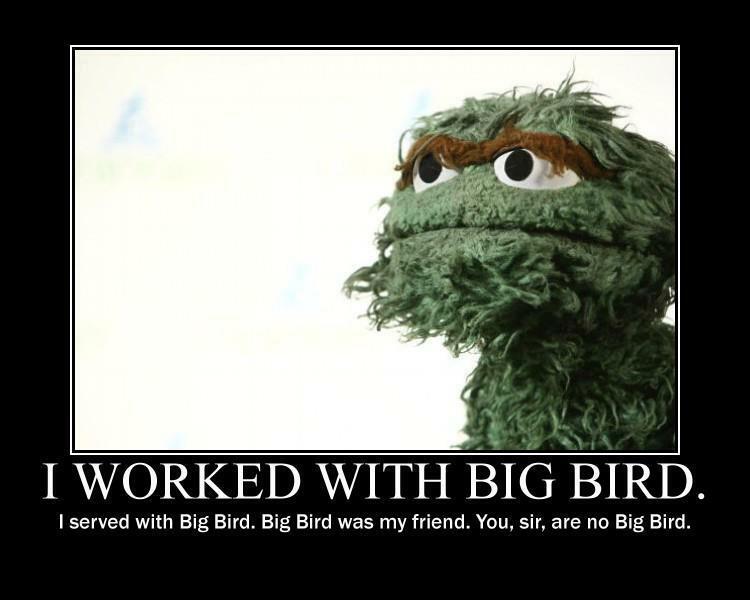 For the record, while I do like Big Bird, my favorite Sesame Street character has always been Oscar the Grouch. As a very young boy I had a poster that showed Oscar's home underneath the trash can...it was way cool. Yes, if you fervently believe in the mission of PBS and you are opposed to Mittens' proposal to cut funding, then by all means make your voice heard. But also put your money where your mouth is and join your local PBS affiliate. Simply complaining while failing to shell out a few bucks for something you support is hypocritical...at best. (*) Note that PBS funding really isn't an issue for fiscal conservatives, it's one for social conservatives. If it really were a fiscal issue and it were ranked in order of "biggest buck for cut" by the federal government, then PBS funding would be about #1569 in line for funding elimination.